Dates: Sunday, September 27th- Friday, October 2nd, 2015. Around 23 km from Alicante city, 15 Km from the Alicante-Elche International Airport and 12 Km to the Mediterranean Sea coast. It is the capital of the El Baix Vinalopó district and the Valencian regions' third largest city in terms of population. Industrial and tourist, modern and fond of its traditions, surrounded on one side by the sea and on the other by the palm trees which cover every corner of the town, life in Elche is nice and laborious; the same as people from there. As it is located in the Mediterranean Basin, it has been coveted by neighboring peoples from other lands since ancient times. These peoples left an important legacy on this land which we can enjoy nowadays. A real sea of palm trees integrated in the town, which creates a unique landscape in Europe: that is the first and unrepeatable sensation you experience when arriving to Elche. This balance has been kept during many centuries thanks to the determination of the people from Elche, which has allowed the town to have a first class natural and cultural heritage. As a proof of that, there is the Camp d'Elx (Elche countryside) which surrounds the town and is an example of preservation of a very singular lifestyle. Elche has excellent transport links as the dual carriageway known as Autovía del Mediterráneo and the Alicante Airport located in El Altet, a coastal hamlet which belongs to Elche; the town also has sound infrastructures and all its creative potential at the service of present and future. All the people that visit or come back to Elche for any reason are always pleasantly surprised. It is big enough to enjoy all the comforts and services of big cities and small enough not to lose the flavor of an approachable everyday environment; its mild climate invites people to enjoy the streets and nature, to be extrovert and to enjoy (as well as to make an effort) side by side. Its two World Heritages, the Palm Grove and the Mystery Play of Elche, confirm something that people from Elche have always been aware of: that sharing our lives is always better. 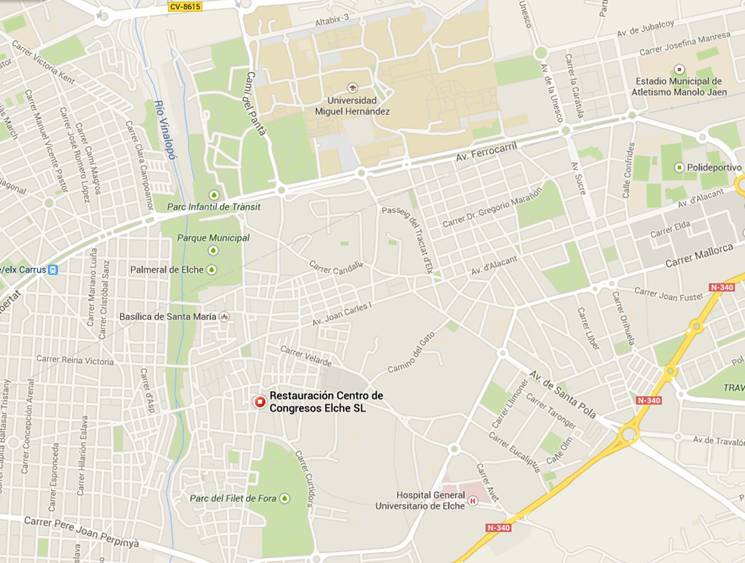 Elche has had two distinct locations in its history. The first one at the site of l’ Alcúdia, which is located two kilometers south of the current city. Inhabited from Neolithic times until the Visigoth era, it offered the strategic advantage of being easy to defend thanks to river Vinalopó. The primitive settlement took shape until it came to form the Iberian city of Helike by the Vth century B.C, and remained in existence up to the Carthaginian invasion in 280 B.C. This was the golden age of Iberian culture, during which the Lady of Elche was sculpted. In the year 209 B.C. the Iberian city was occupied by the Romans, and by the Ist century B. C. it had acquired the title of Colonia Iulia Illice Augusta. From here onwards destruction and reconstruction were ongoing as a result of barbarian attacks during the final era of the Visigoths. With the arrival of the Arabs the city was moved to its current site, between the eighth and ninth centuries, to the neighborhood known as the “Vila Murada” or walled city. The conquest by the Christian King Jaime I, in 1265, forced the Muslims to leave for the Raval de Sant Joan. Early in the 17th century Elche lost a third of its population as a result of the expulsion of the Moors. In the nineteenth century the important activity of “alpargatería” or espadrille-making emerged, and with it the origins of the current footwear industry that has enhanced the growth of the city. Today, over 200,000 officially protected palm trees in the city lend it a somewhat exotic air. These palms are evident on every street corner and can be especially enjoyed in the well-tended city park and just a short walk away in the Huerto del Cura (Priest's Garden) botanic garden, where a palm tree in the form of a seven-armed candelabra is a great example of the freaks of nature. The city of Elche is particularly well known for its arts and crafts. On the one hand you'll discover the unique tradition based on the white palm (palm leaves which turn white when deprived of sunlight for months); and on the other, the footwear industry. Besides being a popular tourist destination, Elche has a thriving industry in shoe manufacture. There are around 1000 shoe factories in Elche. There's also a busy rubber industry that employs 20% of the Elche workforce. White palm weaving is typical in the Palmeral de Elche, an enormous garden of palm trees –declared a World Heritage site– where the white palms are collected and made into attractive decorative articles by the local craftspeople. The best time to see the tradition of the palm are the days just before Palm Sunday (with the Palma Blanca street market) and in October, before and after the re-enactment of the Elche mystery plays. What's more, all year round you can visit the El Palmeral Museum and the municipal crafts workshop located in the centre of the city, and see how the palm leaves are woven. And if you're a footwear enthusiast, you can see how shoes are made by taking one of the guided tours arranged by the Salvador Artesanos factory-shop. You'll also find numerous factory outlets selling directly to the public, as well as others which have their own museum, such as Pikolinos. In the historical area of Elche, there are lots of monuments and buildings to see and most are within easy walking distance. Make the tourist office near the castle your first call and you can collect lots of information and a street plan although the street plan can be a little confusing as there are so many parks. This famous orchard contains over 2000 palm trees and was declared a national monument in the year 2000. Elche is known worldwide for its palm trees. 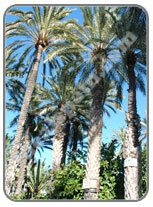 There are several large palm parks in Elche. One of the most popular is the “Huerto del Cura”. This park is where you will find the unique Imperial palm Tree with seven branches originating from one trunk. The park covers 13000 square meters. Entry is €5 per adult, 2.50 € per child. This is just one of many parks in Elche and as you would expect, it's full of palm trees. This is a wonderful place to enjoy both the sun and the shade. The park is filled with tall palms, water features, a band stand and much more. On the other side of the road is the outdoor swimming pool and the sports park where all manner of sports take place. The tourist office can be found on the corner of the Municipal Park. These Arab baths date from the 12th century and include re-modeled Roman baths. Each bath consisted of three rooms, the most popular being the warm bath. Made of stone slabs, the bath was supported by 8 pillars between which, hot air was passed. This practice is what gave birth to our modern day saunas. During the 14th century the building was used as a convent. The baths can be found in Calle Eres de Santa Llucia. They are open to the public Tuesdays to Saturdays 10am-1:30pm and 4.30pm to 8pm. On Sundays the opening hours are 10:30am-1:30pm. Also known as Alcázar de la Señoría and the 'Lord's Fortress' is located next to the Municipal Park. It was originally built in Almohad times (12th-13th centuries), and was later renovated with a brick exterior in the 15th century. This former fortress became a fabric plant in 1913. Over the years it has also been used as the town hall and as a prison during the Spanish Civil War. Today it houses the Archaeology and History Museum. Located next to the Basilica, this 12th century tower was built by the Arabs as a watchtower to watch people entering the city from Alicante. The tower is oblong in shape and is quite unique. No other similar tower survives in the Valencian region. Known in Spanish as Dama de Elche, it is a stone bust that was discovered in in 1897 on an archaeological site at L'Alcudia, around 2km from Elche. This piece of sculpture is believed to be Iberian, dating from the 4th century BC. Over the years the sculpture has had a varied history. It was taken to France shortly after being found. It was shown in the Louvre Museum and hidden during World War II. Franco's government managed to negotiate its return to Spain in 1941. It was placed in the Prado Museum in Madrid then later moved to the Archaeological Museum in Madrid where it remains. It was shown for a while in Elche in 2006. The government of Elche has appealed for its permanent return to Elche but has so far been refused. Instead, Elche has to make do with a replica. When made, the Lady Of Elche would have been painted in full color. There is an ongoing debate about the authenticity of the bust. Many claim it is a forgery. 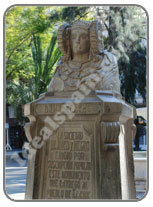 One of the best replicas can be found in La Glorieta which is a small square in the city centre. There's also a copy in the tourist office. The River Vinalpo runs through Elche and has several impressive crossing points. If you stay close to the river you are guaranteed to see the best sights including the Basilica, the Palacio, the Museo de la Fiesta and the old town market. The tourist office have a street plan that illustrates the best walking routes to get the most out of your visit. 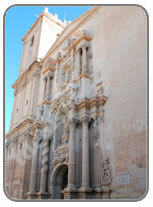 Elche is full of splendid buildings with intricate stonework and a fair share of statues and monuments. Look out for the Lady of Elche. make sure you have stout walking shoes on and take plenty of water with you. You will however, find lots of little cafes in which to rest. The tourist train runs around the city and the Municipal Park. This is a great and easy way to see the best sights. There's a stop outside the park. There's also a cycle hire service in Elche with regular parks throughout the city. 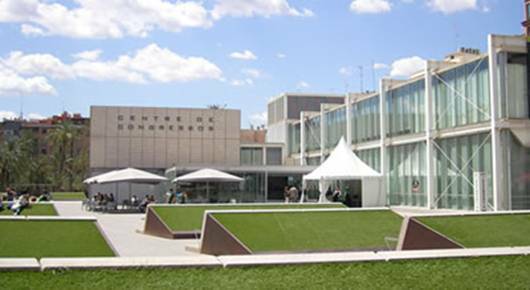 This museum in Elche is dedicated to the 'Festa' of Elche which is the famous mystery play. The museum houses costumes and related items. Located on Diagonal del Palau, this museum is open Tuesday to Saturday from 10am-1:30pm and 4:30pm-8pm. On Sundays the hours are 10:30am-1:30pm. Known as 'MAHE', the museum shows the evolution of Elche since the first settlements. This is one of the most interesting and well planned museums in the region. Located in the Hort de Sant Placid, the entry price is just €1. Open Tuesday to Sunday, the museum illustrates the history and cultivation of the palm trees. This is where you can see an audio-visual presentation about the city. Ideal for firsttime visitors to Elche. It is located in the Municipal Park. Founded in 1980, this museum shows over 150 works of art from local artists.